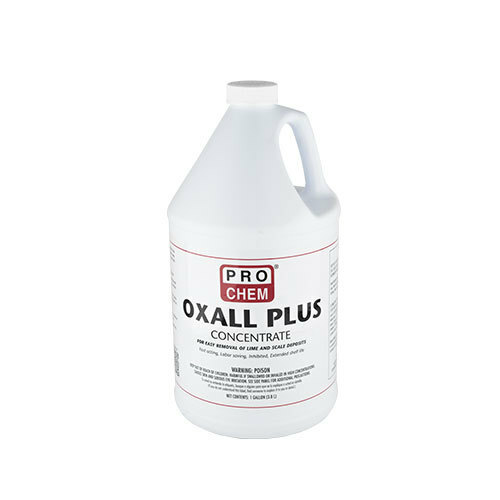 Oxall Plus | Pro Chem, Inc.
OXALL PLUS is great for use in removing mortar stains and film from bricks, masonry and stonework. The aggressive formula quickly penetrates and dissolves lime deposits, scale, and rust from treated surfaces. Its special inhibitor provides “cling” power and slows down the drying process to prevent streaking. It is also an effective product to use to clean concrete handling equipment and water meters. Cleaning rust from concrete: Dilute with 4-8 parts water. Spray or brush on. Rinse well. Water meters: Using a stoneware or plastic container, soak the meter parts in the concentrate until the scale has dissolved. Remove and rinse thoroughly with water. Store in a dry area away from where cleaning has taken place. Cleaning equipment: Concentrate should be used full strength on heavy deposits of lime, scale, or cement. Rinse well with water after leaving concentrate on for a short time. For light deposits, use concentrate diluted with an equal portion of water. Note: Do not use on aluminum, painted enamel surfaces and stainless steel or decorative brass.